A good place to start for those seeking aid in recovery from local disasters is Ventura County 2-2-1. Visit THIS LINK for an intake form to start the process (THiS LINK for Spanish). Note that VCCF continues to raise support for those impacted by the Thomas Fire as well. For those individuals in need of financial assistance in relationship to the Thomas Fire who are not currently working with a case manager, they should reach out to 2-1-1 so they can be assigned to the appropriate organization. The final protocol for financial support for those impacted by the Borderline Bar & Grill shooting has been finalized at THIS LINK. The deadline for submitting a claim is February 18, 2019. For more information, visit www.ConejoValleyVictimsFund.org. Nonprofit organizations responding to the needs from the fires should complete and submit their brief application at www.vccf.org. Organizations can submit more than one time as needs arise. The VCCF Annual Scholarship Program is still accepting applications for local students pursuing their career and educational goals. Over $1 million in assistance is available in 2019. The application deadline is January 30th. Apply at www.vccf.org. 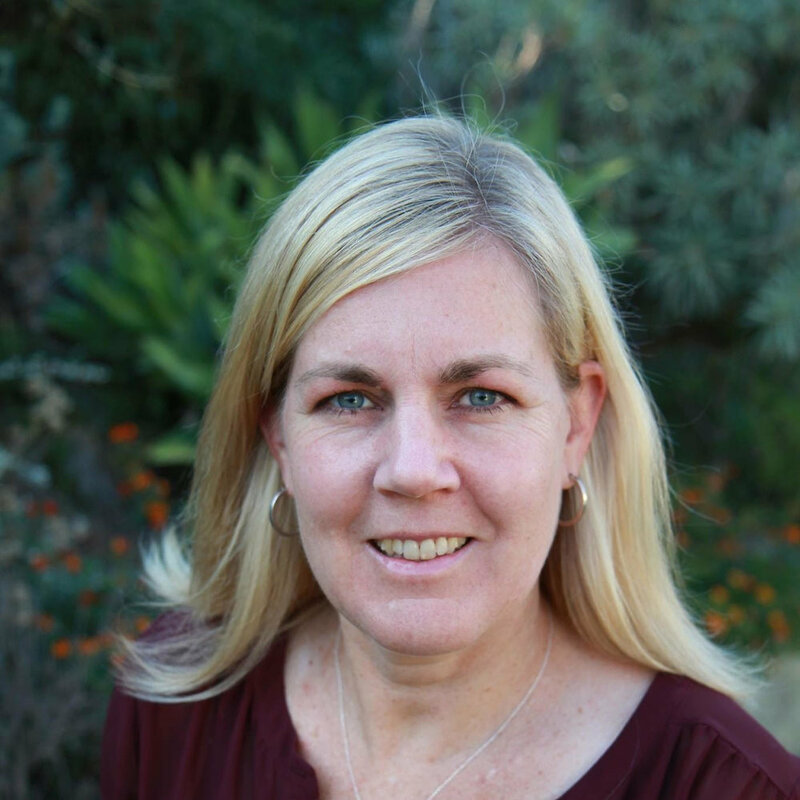 Ventura County Community Foundation (VCCF) President Vanessa Bechtel has provided an update regarding distribution of funds thus far in connection with the recent tragedies in our area. The first two rounds of support to the victims and survivors of the Borderline shooting have been distributed. VCCF awarded an immediate $70,000 in $500 pre-paid Visa cash cards so immediate basic needs could be met through the Thousand Oaks Victims Assistance Center. VCCF also awarded a total of $240,000 to help cover memorial costs to families who lost loved ones. Chief of Police Tim Hagel personally delivered the funds to the families during this devastating time. VCCF is working to award funds as quickly as possible to nonprofit organizations serving those in need during this challenging time. The organization is particularly interested in supporting organizations who are assisting in housing and basic needs, animal welfare, business and resiliency support for our community and medical needs of individuals as a result of the fires. The application is very short and should take no more than 15 minutes to submit at www.vccf.org. VCCF has launched its 2019 Application for College Scholarships and thanks to local generosity will be awarding $1.147 million in scholarships to local students this year – more than ever before! The deadline for applications is January 30, 2019 at 10 p.m. PST. Applications for Support: Massive wildfires that cause severe displacement make connecting and supporting fire victims challenging. While VCCF has received some organizational applications for support, FEMA has received a modest number of applications for direct fire victim support. Please encourage those impacted by the fires to apply with FEMA as soon as possible and to also open a case with 2-1-1 who can help connect resources to those in need. Fundraising for the Conejo Valley Victims Fund: VCCF is in the final stages of raising funds to support the families of victims and survivors of the Borderline shooting. We are working with Ken Feinberg, Special Master of the US Government’s September 11th Victim Compensation Fund, who has volunteered to help advise us during this time. Please encourage all you know to donate now and offer support to those impacted by this tragic event at www.vccf.org. The Discovery Center for Science and Technology Board of Directors is pleased to announce that Vicki Holloway has been named Executive Director of The Discovery Center as of November 16, 2016, following a six-month assignment as a consultant to the organization. Vicki brings over 20 years of experience in the fields of life and environmental science with professional expertise in strategy development, organizational design and efficiency, operations, communications and partner management. She has been an active volunteer in other nonprofit organizations in the community for 15 years. As Executive Director, Vicki will be responsible for fundraising and grant management; volunteer recruitment, retention and recognition; program development and management; and community relations and outreach. Serving residents of the Conejo, Ventura and Los Angeles Counties for over 20 years, The Discovery Center encourages curiosity, critical thinking and creativity through the exploration of Science, Technology, Engineering, the Arts and Mathematics (STEAM). To date, volunteers of The Discovery Center have served over 200,000 children and adults with educational programs and events. For additional information concerning The Discovery Center please go to www.discoverycntr.org. The Discovery Center for Science and Technology is a nonprofit 501(c)(3) tax-exempt organization. Habitat for Humanity of Ventura County will host a grand opening and ribbon cutting for its new Oxnard ReStore and office location Saturday, February 27, 2016 at 9 a.m. The new location is at 1850 Eastman Avenue Oxnard. Join us for exclusive offers, refreshments, followed by tours of the new offices. The Habitat for Humanity ReStore sells new and gently used household items and building supplies, such as furniture, appliances, building materials, cabinetry, windows, hardware, lumber, tools, flooring, lighting and much more. All ReStore merchandise is generously donated by individuals, churches, contractors and businesses, and it is sold at 50 percent below retail value. After locating the perfect space for the Oxnard ReStore, and office we’ve been working hard over the past several months to get the new store and office up and running. With the help of many generous donations, volunteers and our dedicated staff, we are thrilled to launch this next phase for Habitat for Humanity of Ventura County. Now, we’ll have an additional square footage for our Oxnard ReStore to help fund Habitat’s work here in Ventura County, and we hope this will lead to a greater number of homes built each year. After the Grand Opening, the Oxnard ReStore’s regular business hours will be Monday through Saturday, 9 a.m. to 5 p.m. Donations will continue to be accepted at both the Simi Valley and the Oxnard ReStore during our donation hours, and pickups also will be available by appointment. Proceeds from the ReStore help support Habitat’s mission of bringing people together to build simple, decent houses in Ventura County, while providing an environmentally and socially responsible way to keep good, reusable materials out of landfills. For more information about the Habitat for Humanity ReStore or to schedule a pickup at either of the Ventura County ReStores, contact Wendy Monk, Oxnard ReStore manager, at (805-485-6065 ext. 106). Information is also available at www.habitatventura.org. Fit 4 The Cause, a local non-profit that combines social media-fueled flash mobs with fitness education and philanthropic giving, received its 501(c)(3) status a year ago just 90 days after filing with the IRS. Founded by PR expert and ACE certified Fitness Pro Cindy Rakowitz, Fit 4 The Cause continued pushing the limits over the last 12 months, culminating in a packed house at the its inaugural Miracle of Movement Gala at the Sheraton Agoura Hills. What a great event! Led by Fox Sport Radio talk show host Tomm Looney, this gala was entertaining and inspirational. The theme of the night was "Smashing Obstacles." Honorees celebrated for smashing personal obstacles were Lisa Roub, who received the 2015 Advocacy Award and Sourena Vasseghi, recipient of the 2015 Inspiration Award. Roub learned in April 2014 that she had breast cancer at the age of 40. After much research she opted to have a bilateral mastectomy. After the surgery, she was told that the cancer spread to her lymph nodes and would necessitate four rounds of chemotherapy. The thought of losing her hair was now a concern. But she discovered a new treatment, Penguin Cold Caps, that prevents hair loss by freezing the scalp to 40 degrees below zero on chemo days, protecting the follicles and minimizing hair loss. Roub has been cancer-free for nearly a year. She was honored for sharing her experiences with others in need of support and advice. Vasseghi is an award-winning author and inspirational speaker who suffers from severe cerebral palsy. Although he has limited motor skills and a significant speech impediment, he is an award-winning author and inspirational speaker. But since he can't really speak to an audience, he has partnered with "interpreter" Chris Stevenson of Stevenson Fitness in Oak Park. The duo had us both laughing and crying as they took us through some of the challenges Vasseghi faces in life and how we all can learn from them. Vasseghi is an Agoura Hills resident and is married with two kids. You have to meet this guy. Learn more at sourenav.com. We also enjoyed a conversation with NFL linebacker Brady Poppinga at the Gala. Poppinga shared thoughts on commitment and returning from injury over the course of his career. After playing at BYU, he was drafted in 2005 by the Green Bay Packers, where he played six years, then the St. Louis Rams and Dallas Cowboys. Two thumbs up to all of the great sponsors for this event that made it happen, with a shout-out to Champion Level sponsors Edison International, Humana/Brian Sullivan and the Law Offices of Friedman & Bartoumian. 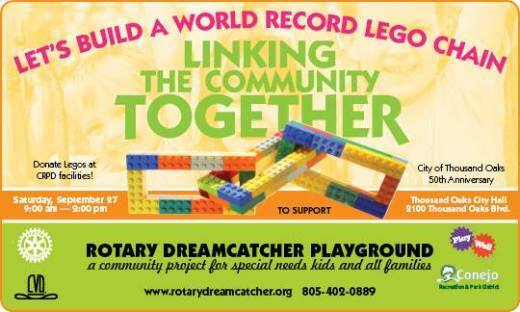 World Record LEGO Chain Event is taking place on Saturday, September 27th from 9 AM - 4 PM at Thousand Oaks City Hall. We are attempting to break the Guinness Book of World Records by building the World Longest LEGO Chain. We need your help to do it. We have over 100,000 LEGO bricks and need some families who love building with LEGOs to help us build it. This charity event is a collaboration between the Conejo Recreation & Park District, Rotary International, and Play-Well TEKnologies to raise money to build a state of the art special needs playground at Old Meadows Park in Thousand Oaks. FIT 4 THE CAUSE™, a non-profit that combines social media-fueled flash mobs with fitness education and philanthropic giving, recently received its 501(c)(3) non-profit determination in only 90 days! Founder, Chair and President Cindy Rakowitz has parlayed that momentum by securing a board of directors that includes celebrities FOX Sports broadcaster Tomm Looney, actor and director Paul Michael Glaser and actress/stuntwoman Caryn Mower. Neurological specialist Dr. Lorne Label - previously chief of staff of the Los Robles Medical Center and Clinical Professor of Neurology at UCLA has also joined to its Board of Directors. PR Guru and Author Rakowitz, who recently received her ACE (American Council on Exercise) Certification indicates “Now we are poised to operate a serious, successful strategic business. FIT 4 THE CAUSE™ raises money and awareness for local and national health needs by staging flash mob-style group exercise programs led by professional instructors and live DJs. Participants and spectators are encouraged to donate to the designated cause. Since each event features unique themes, diverse exercise disciplines and a variety of health related causes, FIT 4 THE CAUSE™ guarantees a unique educational experience complementing the traditional gym workout. Local resident Rachel Shur was recently presented with the National Gold Presidential Volunteer Service Award from the Corporation for National and Community Service by Senior Chaplain Dan Regan, United States Chaplain Service. He also presented her with a signed letter from President Obama and a Gold Presidential Volunteer Service Award Pin. Shur is a two time cancer warrior who beat terminal leukemia in 2006 and again in 2007. She is the founder of the United Cancer Advocacy Action Network (UCAAN), a 501(c)3 all volunteer run organization in Thousand Oaks. Over the past five years, Shur has dedicated her time and energy into UCAAN and the people it serves: 2,575 cancer warriors, patients, survivors and their families have been helped by UCAAN and its team of dedicated volunteers. Before Shur founded UCAAN, she volunteered her time to help other organizations and shared her cancer story at health fairs, local high schools and colleges. Eventually, it wasn’t enough for Shur and she saw what really needed to be her focus, the start of an organization unlike any other, a one-stop resource organization that would help cancer patients locally and nationwide. UCAAN continues to grow as Rachel tirelessly does all that she can to help those struggling in our communities and beyond to find the help they need when they need it. UCAAN’s focus is “Finding Solutions for Cancer Patients in Need Locally & Nationwide.” UCAAN has an extensive database of over 1,800 organizations nationwide that offer an array of support for those affected by cancer. UCAAN also has a personal fundraising program, in addition to two local financial assistance programs: Gas Cards to local patients to help them get to their treatment appointments, and fluoride trays to prevent dental deterioration caused by most cancer treatments. Additional services are planned for the future. UCAAN helps anyone, any age with any form of cancer, nationwide. To find out more information about UCAAN or to make a donation visit www.UCAAN.org or contact the UCAAN office at 805-796-6090. To speak with Rachel Shur directly, call 805-479-1032 or email her at UCAANorg@yahoo.com. The President’s Council on Service and Civic Participation (the Council) was established in 2003 to recognize the valuable contributions volunteers are making in our communities and encourage more people to serve. The Council created the President’s Volunteer Service Award program as a way to thank and honor Americans who, by their demonstrated commitment and example, inspire others to engage in volunteer service. The program continues as an initiative of the Corporation for National and Community Service.